Four years after releasing Black Symbol’s “Journey” album, Sugar Shack Records are pleased to present another set of new recordings with “Behold”. 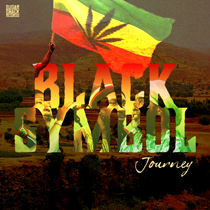 For this new collection, Black Symbol has returned with a mix of roots, social commentary, spiritual music and even a love song as well as visiting some classics of the reggae genre. 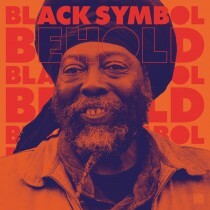 As has been the case throughout his career Black Symbol has self-produced his music and collaborated with other Birmingham musicians and singers including Steel Pulse’s Selwyn Brown on keyboards; the recordings engineered by Angus Jones and Birmingham reggae legend Wooligan. The final mix was handed over to the experienced and regular Sugar Shack collaborator Compendulum who himself has a reggae career stretching back nearly as far as Black Symbol’s. This isn’t a youthful album full of anger and rage at injustice, songs of youthful bravado and boasting or songs about girls and partying. It’s a mature work from a man looking back at his life, a retrospective filled with maturity recalling a distant Jamaican childhood, reflecting on spirituality and celebrating a love that has lasted, covering some favourite songs whilst also finding time to deal with the more serious themes that are just as relevant now as when Black Symbol started four decades ago. The album kicks off with “Mother of Creation” an obviously modern track that still manages a classic seventies feel with its repetitive message to teach the current generation a true message of love, a message that is unfortunately lost on so many of this nation’s youths. “Collie Bud” with its Aston Barrett inspired bassline, reflects on Black Symbol’s childhood in rural Jamaica, a childhood of bountiful small farms where there was always enough food for one’s family as well as feeding the hungry. It also celebrates growing ones’ own collie “for the healing of the nation”. “Mama Say” is Black Symbol’s take on the Heptones mid-seventies classic whilst “Behold”, is his unique acapella take on the Culture original with its choral backing for the chorus taking on the mantle of a gospel spiritual; perhaps another recollection of a Jamaican childhood though now coupled with a Rastafarian message. We think that the more you listen to Black Symbol’s take on the song the more it rivals the original. There is a vulnerability and honesty in the performance that really adds another layer to the meaning of the lyrics and outdoing the great Joseph Hill is quite an achievement. “Vampire” returns to more standard roots fare with its message to be aware of “vampires” who try and keep you down whilst finding inspiration in Jah will lead to redemption. “Solidarity” calls for unity in a world full of division. “Throw Down Your Arms” draws upon and adapts the Burning Spear song of the same name, it’s light upbeat backing contrasting with its deadly serious message. “Really Have to Pray” does exactly what it says on the label, encouraging listeners to pray to Jah and once again warning about “vampires” and “vultures” that will be kept at bay by a pure heart. “My Empress” provides a change of pace with a heartfelt love song whilst the final track “Brutal”, again returns to images of rural Jamaica and farming and the constant regimen of work needed just to survive as a small farmer. As a bonus we’ve included four dub versions mixed by Compendulum who was given a free hand to imprint the music with his own distinctive style. Black Symbol’s “Behold”, (FOD119), is released on Limited Edition 8 track Vinyl, CD and digital download by Sugar Shack Records on 9 th November 2018, distributed by Shellshock Distribution via Discovery and available in all good record shops and on all digital platforms. The new album “Judgement Day”, sees a slight departure from our previous releases as the band is now billed as featuring original founding member JB whose face also graces the album cover. Although not unique to reggae, a common occurrence is a group splitting into two separate camps both adopting the original band name. To avoid any confusion, we’ve decided to rebrand by adding JB’s name to our future releases. This is basically the same band as on our previous full-length releases “Wolverhampton” and “Wolverhampton in Dub” and a continuation of Capital Letter’s long history of recording and performing as one of the most popular British reggae bands; the name has been tweaked, but the music and vibes remain unchanged. “Judgement Day” features 13 tracks with the usual mix of strong roots including “Follow Rastafari”, “Talking”, “The Roots” and “Judgement Day” which is an entirely different mix to the previously released 12”. The album has social commentary with “House Breaker” and “Parents” and even touches on more romantic themes with “Your Heart and Mind” and “Cinderella”. The tracks have been recorded in Birmingham, UK and mixed by labelmate Compendulum. We have here vintage Capital Letters but featuring Harrington Bembridge (The original Selecter drummer and later of fellow UK ska stalwarts The Specials) and new bass player and Birmingham legend Myki Tuff. Capital Letters featuring JB “Judgement Day” is released on 10th August 2018 by Sugar Shack Records, distributed by Shellshock Distribution. It will be available from all leading retailers and available on major digital platforms. As well as the 13 track CD and digital versions of the album there is also an 8-track limited edition Vinyl. Very few bands can celebrate forty years since their creation and far fewer can still perform and record at an equal or even higher level than in their early years. Talisman have always been something of an exception to the rule. Although they took something of a sabbatical during the late nineties and noughties, at their core this is the same Talisman that formed as Revelation Rockers back in 1977. They may have been forced into a name change along the way, but they never ever changed the messages in their music or the sheer energy and enjoyment of their live shows; their talents are undiminished. To celebrate the band’s longevity and give fans old and new a career spanning perspective in a convenient package, we are releasing “Nothing Change” (The Best of Talisman 1977-2018) a 17-track compilation that includes the band’s earliest recordings under the guise of Revelation Rockers to tracks from last year’s acclaimed “Don’t Play with Fyah”. Throughout changing times, technology and line ups the core of founding members Dehvan Othieno and Dennison Joseph give the music a remarkable continuity and demonstrate how some musicians improve with age. Of the three Revelation Rockers tracks only “Jah Praises” has previously been given a proper CD release, both “Culture” and “Wicked Dem” make their debut appearance on CD. All three tracks show a band that hit the ground running with well written songs and their own sound. It’s interesting to compare their first recording of “Wicked Dem” with the reworked version that would feature on their second single four years later. Naturally all four sides of the band’s first two singles from 1981 have been included in the form of the original 7” mixes, “Dole Age”, “Free Speech”, “Run Come Girl” and the aforementioned second version of “Wicked Dem”. Unfortunately, a lack of space precluded the longer 12” workouts which are well worth tracking down. 1984′s debut album “Takin’ The Strain” donates not only it’s title track, but also “Lick and Run” and “Ah What You Seh”, all well-rehearsed favourites of the band’s live appearances back then. What might be termed a comeback album and their first recordings after reforming, 2013′s “I-Surrection” provides four tracks with “Greetings and Salutations”, “Hey Yout’”, “Things Ah Get Tough” and “Help Yourself”. The album is completed with three tracks from last years extremely well received “Don’t Play with Fyah” release, “Talkin’ Revolution”, “She Looks Like Reggae” and “Relijan” which proved something of a hit last year garnering strong radio play across Europe. These three tracks demonstrate that even after forty years Talisman continue to innovate and improve with age. 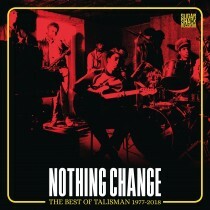 “Nothing Change” (The Best of Talisman 1977-2018) is released by Sugar Shack Records on CD and digital platforms on 25th May 2018, distributed by Shellshock and available from good retailers worldwide, it provides the perfect introduction to one of the best reggae bands Britain has ever produced. Bristol’s Laid Blak have trailed a unique path through the music jungle and picked up influential friends on the way. They don’t come much bigger these days than this key ally – Ed Sheeran. The red-haired one is a big fan, so much so that he used a section of the band’s earlier signature tune, ‘My Eyes Are Red’, in one of his own album chart busting songs and to close his shows. It’s a useful thing to have in the creative locker, but Laid Blak’s new second full album, ‘About Time’, more than stands on its’ own merits. Core members, DJ Bunjy and MC Joe Peng, easily use every strand of elements that turn their ears and make a musical cocktail that is heady and delicious. There’s something for everyone, regardless of age or musical taste on ‘About Time’. It comfortably straddles styles that cover a range of bases in contemporary reggae music. And most of the time it’s anything but laid back! 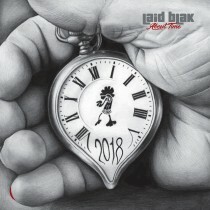 Exclusive signed copies of the sensational Laid Blak album ‘About Time’, includes limited edition poster. Sure, the breezy album opener ‘Cool Dude’ is more low-key, the band taking the brave step of introducing themselves here with a track that is programmed riddims, rattling percussion, piano, keyboards and restrained, jazzy, minimal bass! It’s – well – cool, but filled with humour, whistling, street observed lyrics, scatter-fire vocals and am easy confidence that radiates. But after that the fare on offer heats up, seeing a glorious classic dancehall style tussle on ‘Mic Man’ with the fabulously UPFUL and agile vocals from Tita Lau adding a winning dimension. The guest female singers – Tita and the equally dextrous Tanya Lacey – add a soulful and playful dimension to other up-tempo blasters like ‘It’s A Pity’, ‘Hold On’, and ‘Serious’ which head out into anything from lovers rock to a sleng teng, old school step it, rub a dub, wrap it up, mash it groove with fat horns, melodica, wailing guitar, sound system busting bass and kicking rhythms. There is some serious business attended to in ‘Changing’, which illustrates how priorities change in life, and how in ‘No Way Out’ and the darker, more militant Aswad era take in ‘I Feel It’, that life isn’t easy. But that period of reflection is a temporary break as it’s always the contrast of celebrating life in the cheeky, chatty Smiley Culture vibe of ‘Little Bit of This’, and the Mediterranean holiday romance possibilities in ‘Fatal Attraction’. Fresh, fun and fabulous while flowing with great tunes, this is an irresistible album of the band’s distinctive brand of street soul. It’s so powerful that the band felt the need to do a rush release of it! This is music that just can’t be contained or limited. Laid Blak don’t fail in their objective to bring ‘a fun filled sunshine dance music that keeps your feet moving and your face smiling.’ So, bang on cue, spring and summer is a’ coming, and about time too! Fire up the barbeque, slap on the jerk chicken to the flames, grab an ice cold Red Stripe and put on ‘About Time’! Let the party begin! “About Time” is released by Sugar Shack Records on CD and digital platforms on 6th April 2018, distributed by Shellshock and available from good retailers worldwide. 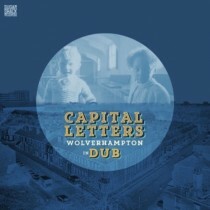 Capital Letters followed up their well received return to live touring by releasing brand new music with 2015′s “Wolverhampton” and it’s dub counterpart. Since then, they’ve continued to perform their authentic brand of British reggae to enthusiastic audiences across Europe as well as at home in the UK. Despite a busy touring schedule, the band found time to write and record new material. Fans will be glad to know that a brand new album is in the pipeline, but we thought we’d treat everyone to a tasty appetiser in the shape of brand new track “Judgement Day” released as a limited edition four track vinyl 12”. Capital Letters were formed more than forty years ago and so it seemed appropriate to entrust the mixing of “Judgement Day” to someone with similar longevity in reggae, Bristol reggae stalwart Chris Potter, better known by his pseudonym Compendulum. This isn’t the first meeting between Compendulum and Capital Letters, Chris previously remixed the band’s “Jah Music” for his eponymous compilation album released in 2016. Given such a strong track to work with, Chris has kept things simple serving up double helpings of vocal and dub aiming for the feel of exclusive dub plate mixes. The vocals carry the deep message of roots reggae at it’s best, repent, repent, repent! JB’s vocals fit perfectly the serious theme, “do some good today, good will follow you”, if you want redemption then live a good life; the biblical imagery and Rastafarian message is underpinned by deep, deep bass and propulsive percussion. Both dub mixes reject modern gimmickry and are firmly planted in the classic old school dub mould, bass lines, percussion and stereo effects to the fore whilst making good use of the apocalyptic feel of the vocals. To this listener, “Drub A Drub Version 4” sounds like something of a homage to early eighties Sly and Robbie or at least something influenced by their dub workouts and for me that’s no bad thing, the fact that Compendulum’s mix is reminiscent of the rhythm twins is no mean complement. This is a twelve inch that works on multiple levels; it’s a classic slice of Capital Letters to keep their fans happy until the full album drops. Its great roots reggae vocals, its classic dub mixing and more than enough weight to keep all sound men happy, a record that will appeal to everyone. “Judgement Day” four track is released as a limited vinyl 12” and digital download on 1st September 2017, distributed by Shellshock Distribution available from all good retailers worldwide and on all good digital platforms. When it came to choosing the second release from their new album “Don’t Play With Fyah”, Bristol Reggae legends Talisman decided to keep things local and let fellow Bristolians and legends in their own right, Dubkasm, have their pick of the album masters to imprint with their signature ‘sound system friendly’ style. Dubkasm chose to rework “She Look Like Reggae”, taking the characteristic Talisman band sound and stripping it away, honing in on just the lyrics, they needed to change the song’s vibe entirely and re-clothe it in new dance hall finery. The vocal is remoulded as a heavy roots cut propelled by a steppers drum riddim echoing those lyrics that have been chosen. After a slow build, the track moves along with the momentum of a juggernaut guaranteed to fill the dance floor; it drops into a dub workout finishing with a touch of distortion as though heard through a big stack. The dub side does exactly what it says on the label updating the classic Talisman band sound to a more sparse and minimalist one that will sound great in a dance. This is a record that will appeal equally to fans of Talisman and Dubkasm as well as the wider reggae audience. 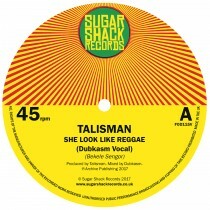 Naturally “She Look Like Reggae” Dubkasm vocal and dub could only be released on the soundman format of choice, the 7” vinyl single in a strictly limited edition and is released on Sugar Shack Records on 26TH May 2017 distributed by Shellshock/ SRD and available from all good retail outlets. Pressed on beautiful clear vinyl with Colour Insert and includes limited edition signed poster from the band. Comes with an 8 page booklet. 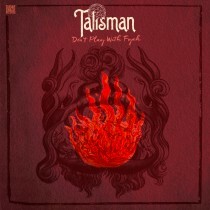 Talisman’s new album “Don’t Play with Fyah” is a revelation. Most bands with a history that stretches back four decades are content to go through the motions, their creative peak somewhere in the past, not Talisman. Their new album includes some of the strongest material they’ve ever recorded, with seven brand new songs and the corresponding dub counter parts; this is their finest album to date. With such strong material we knew we had to pull out all the stops when it came to the final mixes and who better than legendary musician, producer, engineer and all round British reggae genius Dennis Bovell (Matumbi, Steel Pulse, Linton Kwesi Johnson, Aswad, Madness, Orange Juice, The Slits, The Pop Group, Arcade Fire, Joss Stone) who has taken the songs to the next level and given us the strongest British reggae album in years. The album kicks off with “Relijan”, a roots anthem with lyrics that resonate with contemporary relevance whilst the music has the timeless feel of the best seventies roots. This track raises the game for Talisman and puts them on par with such British greats as Aswad, Steel Pulse and Misty in Roots at their best; without doubt destined to be seen as a classic of the genre. The pace and the lyrical intent doesn’t let up as we start “Talkin’ Revolution” which for long time fans of the band is a real treat; a brand new song yet imbued with the feel and vibes of early eighties Talisman. It would not have felt out of place in their sets during those years and yet, this bridge between the past and present manages to surpass what went before, a real achievement and another certain future favourite for fans. “She Look like Reggae” is a charming piece of observational song writing that rewards repeated listening with hidden depths and also provides a good opportunity to mention the very welcome use of a full horn section on some of these tracks. There’s something right about Talisman with horns that once again ties their long distinguished musical heritage in with the present. “Don’t Play with Fyah” is another strong tune with a different style of vintage feel and also lends its title to the album. It is followed in a similar vein by “Hear No Evil” and “Racism Never Sleep” rounding off a trio of songs carrying a warning message, those messages perhaps being more relevant now than at any time this century. Rounding off the vocals with something of a change of pace is “Wheel and Come Again”, a joyful and upbeat song that has a pop sensibility but in the best sense; a song that will appeal to a wide audience. It’s hard to overstate Dennis Bovell’s contribution to British music, reggae in particular and we can’t think of anyone more qualified to mix these tracks. Dub mixes really are his forte, with more than four decades of experience mixing the best in British dubs. The seven dub versions here, deliver in every way, true dub re-imaginings and not mere afterthoughts. Dennis has refashioned them into alternative mixes, shifting focus, taking whole new pathways as he navigates the multi-tracks, sometimes familiar, sometimes with an entirely new emphasis. These dubs happily stand on their own merits and let’s hope that this is just the first of much collaboration with the great Dennis Bovell. In addition to the 14 track CD and digital download version, there is also a limited edition vinyl LP featuring four of the vocals and their corresponding dub versions, Talisman’s “Don’t Play with Fyah” is released by Sugar Shack Records on March 17th 2017. Distribution by Shellshock/ SRD and available from all good retailers worldwide. Reggae has been around for nearly fifty years and as such, it’s rare to find an album that takes a truly new and unique approach to the music, but that is exactly what “Compendulum” does. This album isn’t a compilation, it’s not a remix project, it’s not the vision of one producer or musician, it’s not old and it’s not new, yet it is also in part all of those things and most importantly totally fresh and enjoyable. As someone who played in both Zion Band and Talisman, it was only natural that Bristol Archive Records head, Mike Darby would establish contact with Chris, which led to Mike giving Chris access to various masters to see what he could come up with. The results are now available for everyone to hear on “Compendulum”, a 16 track compilation of Chris’ take on how some old and new, familiar and unfamiliar tracks should sound. Mike gave Chris free reign and thirty years outside of the music business has given him an entirely fresh approach to mixing. He doesn’t try and make them sound vintage, he doesn’t follow any fashion, he just follows his instincts and they are spot on.Six of the tracks are from Birmingham’s Black Symbol which are the earliest recordings on “Compendulum” and date from the early 1980s. Whilst we were compiling Black Symbol’s album, we realised there were several unreleased recordings missing and whilst searching for these we came across additional unmixed tracks on a 2” tape which is the source for the four vocals and two corresponding dubs. The resulting mixes are quite straight but timeless, taking Black Symbol in a mellower and laid back direction, emphasising the beauty in their music although “Jah Children Come First” is given the urgency it deserves. The other vintage recordings are those by Prince Green aka Drummie, not only did Chris have carte blanche he also had to add various missing parts to the incomplete and unmixed session tapes. Drummie grew up in Kingston Jamaica, surrounded by music, his elder brother being a member of the Slickers. Moving to England he eventually settled in Bristol where he lived for many years collaborating with the Moonflowers and Henry and Louis, as well as toasting with his unique voice at many a local reggae night. Something of Drummies’ MC voice can be heard on “Cross Country Driver” where his Prince Far I vocal style is fused with a break beat rhythm to create a hypnotic hybrid, whilst “Slave” is heavier and hints at the mental illness with which Drummie battled. Fellow local legend Jashwha Moses also started his career back in the seventies. Chris has chosen a vocal and dub reworking for “What a Situation” the first track from Jashwha’s latest album, 2015′s “The Rising”. The final tracks are also from the Sugar Shack back catalogue. We return to the Midlands with Wolverhampton’s number one reggae export Capital Letters and “Jah Music” the opening track on their 2015 album “Wolverhampton”. 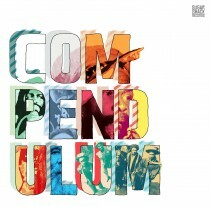 “Compendulum” is a unique album which sees Chris exploring the Bristol/Reggae Archive and Sugar Shack catalogues old and new, released and unreleased in a new approach to the various artists’ compilation and is released on CD and digital download by Sugar Shack Records on 10th June 2016 available from all good retailers worldwide. 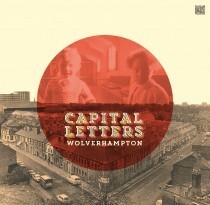 Earlier this year, Capital Letters released “Wolverhampton” their first new album in thirty years which received universal praise and outstanding reviews. Vive Le Rock magazine compared it to Marvin Gaye’s “What’s Going On” calling it “a barnstormer of an album that instantly get’s under your skin and grows in depth and stature with each listen”. Reggaeville suggested it was “a hot contender for album of the year 2015”, Uber Rock’s reviewer stated: “There is not a weak track on this album, in fact I would go as far as to say this is potentially the best reggae LP I have reviewed so far!!!!! Definitely the strongest album I have heard from the genre in a very long time”. Record Collector praised the songs serious heavy messages awarding the album four stars. With such fantastic reviews and an equally positive reaction from fans, we decided not to delay any longer with the release of the album’s dub counterpart “Wolverhampton in Dub”. For this version, we shine the spotlight on mixing engineer and Sugar Shack regular Dave ‘Oldwah’ Sandford who was given free reign and has produced something to be proud of. Dave has more than succeeded, he’s achieved something unique. This album has echoes from the entire history of dub reggae in all its incarnations, snatches of music that sound familiar and yet it also manages to forge that most difficult of things, a new direction for the genre. This is Dave’s strongest work for us and will no doubt gain him a flurry of new fans; ‘Oldwah’ is becoming the dub master. 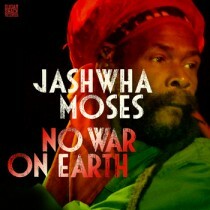 Having taken more than thirty five years to deliver his first original album, Jashwha Moses has taken heed of the overwhelmingly positive response from fans old and new and wasted little time in recording a brand new follow up to 2013′s “No War on Earth”. The new album titled “The Rising” continues to spread the Jahggae message with backing from Full Force and Power and the production side of things once more being undertaken by long term collaborator Mikey Hall. Building on the success of the previous album and having spent the last two years honing both his performance skills and his songs through a series of well received live shows, Jashwha’s music has progressed and evolved yet, at the same time he delivers more of the same with a selection of roots music infused with his own blend of spirituality. Particular treats include the songs “Crazy (Version)” and “Nothing to Lose” where Jashwha utilises his falsetto voice to great effect. “Crazy (Version)” in particular, is very reminiscent of Junior Murvin during his classic Black Ark period which in itself is some compliment to Jashwha’s singing ability and Mikey’s production values. “The Rising” is released by Sugar Shack Records on 22nd June 2015 and is available as a vinyl LP containing nine songs and as a CD and digital download both of which round the number of songs up to an even dozen. 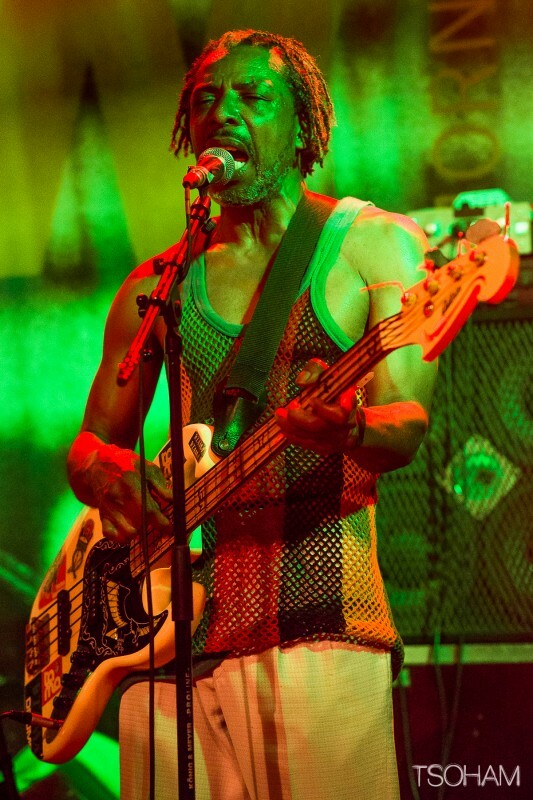 Having reformed in 2013, it hasn’t taken Capital Letters long to get back into their stride and 2015 sees them embarking on a series of European live dates reminiscent of their heyday in the late seventies and early eighties when they were the unofficial UK reggae ambassadors to Europe, constantly touring throughout the Continent. To coincide with the start of these dates, Sugar Shack Records will be releasing the first all new Capital Letters album in thirty years. The band have spent much of the summer in the studio of Noel Browne, Noel only recently relocated to the UK and built his new studio. He’s a former Studio One Band, Taxi Gang and Maytals keyboard player who is perhaps better known as the man behind New Name Music, the studio he set up in 1987 where he was to achieve success with Luciano, Mikey Spice and Jack Radics amongst many, before building Big Ship Recording Studios in 1995 where he worked with Freddie McGregor, The Wailing Souls, Papa San and numerous others. Utilising Noel Browne’s engineering skills, the band recorded 14 songs which were then passed into the safe hands of regular Sugar Shack collaborator Dave ‘Oldwah’ Sandford for final mixing. 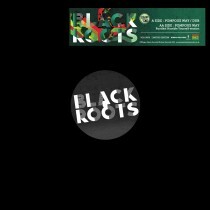 The album kicks off with a trio of classic roots tracks, “Jah Music”, a highlight of their live shows, “Wolf” as recently released in a remix form on a Sugar Shack 12” and “Roots Music”. Just when you think the pattern is set, the band turn things around and with a novel approach they continue with a mainly roots themed set, but in a case of an iron fist inside a velvet glove, hard hitting roots messages are underpinned by often upbeat backing. The songs; “Place On Earth”, “Dat Nah Stop”, “False Natty”, “Tell Me What’s Wrong” and “Opportunity” all contain strong messages that may be missed on casual listening with their deceptive, almost too upbeat backing tracks, an unusual approach that shows just how confident and skilled the band are. It’s not all politics and preaching. One of the songs is a heartfelt tribute to the band’s home town, Wolverhampton in the British Midlands. It was obvious that with Capital Letters strong ties to the City, this was the perfect track to name the album after and so “Wolverhampton” is the album title and will no doubt have more than a few of the band’s overseas fans checking their atlases. A perfect companion piece to “Wolverhampton” is the track “Jamaica” which paints a charming child’s eye picture of the huge changes and culture shock encountered by the children who arrived in Britain to join the windrush generation during the fifties and sixties. Co vocalist Lukas doesn’t forget his past as a Lovers Rock artist and we are treated to a solitary love song with “Movie Star”. Lukas puts in such a consummate performance, it makes one hope the band will record more material along similar lines in future. Capital letters are a band at the top of their game; they have maturity, confidence and musicianship to spare. This is a deceptive album, the more you listen the more it reveals the depth of quality within, good on first listen it grows in stature and really rewards repeated plays. “Wolverhampton” is released by Sugar Shack records on 23rd March 2015 as a digital download and compact disc available from all leading sites and retailers, there will also be a limited edition vinyl album containing the first five tracks along with their accompanying dub mixes. 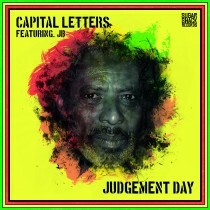 2014 has been a comeback year for legendary British reggae band Capital Letters. Reforming after three decades they have performed at well received gigs in England and France, released the 1980s recorded “Reality” album and a truly excellent 12” remix EP on our sister label Reggae Archive Records. As well as performing live shows, the band have found time to return to the studio and record new material for a brand new upcoming album to be released in 2015. The team of David Hill on production and Nick Manasseh on engineering and mixing duties, who were responsible for the “Smoking My Ganja” Rootikal Remix EP, were keen to collaborate with the band again. Having chosen one of the new songs “Wolf”, they were given a free hand to mix their own versions. The results of this second meeting between Rootikal Productions and Capital Letters, is a four track twelve inch featuring four different cuts of “Wolf”, a brand new track from Capital Letters but with the authentically vintage feel you can only get from a band that started out in the early 1970s. The sound has been skilfully enhanced by David Hill and Nick Manasseh, a team that appreciate the subtleties of the classic reggae mix.Side A leads off with “Wolf (Rootikal Re-Mixdown)” the main vocal mix, with founding member JB on lead vocals warning us about false Rastas, false Christians and hypocrites in general. Both lyrically and production wise this could be a lost recording from the 1970s, proper old school roots reggae, “Wolf leave the sheeps and the shepherds alone”. The A side is completed with a second vocal mix in the shape of “Wolf (Rootikal Dubplate Mix)” a sparser mix where the vocals are given more room to breathe. Side B provides the perfect compliment with some mellow dub vibes with “Wolf (Rootikal Dubwise)” a proper vintage style dub mix. David Hill and Nick Manasseh then strip the track back to its rhythmic essentials with “Wolf (Rootikal Deep Riddim Dub)”. Four excellent cuts, something to please all roots and dub fans and an ideal taster for next year’s brand new album release. 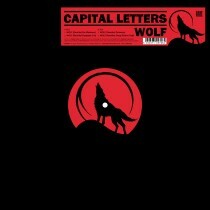 Capital Letters “Wolf” on Sugar Shack Records is released as a limited edition 12” vinyl single and digital download on 24th November 2014 and will be available from all usual outlets. Jean McLean’s solo album “Everlasting” has been a long time coming. It has been thirty years since her vocals and musicianship were such a highlight of Sceptre’s “Essence of Redemption Ina A Dif’rent Styley”, (Reissued on Reggae Archive Records), but releasing reggae has always been a struggle and talent doesn’t always equal opportunity. Fortunately, 2014 has seen everything fall into place. Jean had begun working and recording with Ecks Production’s Paul Horton, one of the UK’s best when it comes to engineering and producing reggae. As well as Grammy nominations under his belt for previous work with Steel Pulse and Pato Banton, Paul also produced a previous Sugar Shack release, Black Symbol’s excellent “Journey” album. We originally met Jean to discuss licensing the Sceptre album but when we heard that she had been working on an album with Paul, we were very keen to hear it and “Everlasting” was everything we had hoped for and so much more. We jumped at the opportunity to release such a great contemporary recording. Although Sceptre folded in 1987, Jean has never given up music and has continued to hone both her vocal and song writing skills. The resulting album is something of an instant classic and should finally get Jean the attention her talent deserves. Of the nine vocals, seven are original compositions written by Jean. The album gets off to an up-tempo start with “Meant 4 U”, a classic love song with a timeless feel. We then switch to a roots vibe with Jean’s updated version of a song from the Sceptre catalogue “Ancestors”. The original featured on “Black Symbol Present Handsworth Explosion Volume One” and was a standout track. This updated twenty first century version is equally outstanding and shows that Jean feels at ease whether singing about matters of the heart or more political themes. “Reggaebaby” might be regarded as Jean’s theme song as she joyfully sings: “This is my life if you know what I mean, to be a reggae singer is a lifelong dream”; this album is surely a step in Jean fulfilling that dream. The rest of the album returns to themes of love and romance. “Me on My Own” has the feel of an instant classic, a great original from Jean, catchy and up-tempo. “Love Me Baby” is another upbeat track with a great vintage feel. “Higher”, “Never gonna” and “So Close” round up the original numbers and maintain the theme of catchy, well written songs. For good measure, we are treated to a couple of covers but tunes of the highest order with Bob Marley’s “Waiting In Vain” and Dennis Brown’s “Things in Life”. Both have been nicely brought up to date and given Jean’s unique take, feeling totally at home amongst her original compositions. As a bonus, six of the tracks are joined by their dub counterparts ably mixed by Paul Horton and there is also an instrumental version of “Waiting In Vain”. 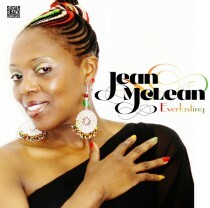 Jean McLean’s “Everlasting” is a fantastic debut from Birmingham’s best kept secret and a true reggaebaby. It is scheduled for release on 20th October 2014 by Sugar Shack Records and will be available on CD and digital download from all usual outlets. Thirty five years since their formation is quite a milestone and to celebrate their achievement Talisman, will spend the latter part of 2014 touring throughout the UK on their Dole Age Tour in the main as support to Neville Staple. Talisman have also found time to write and record new material and to coincide with the tour they will be releasing a limited edition 12” vinyl EP. In many ways Britain in 1979 was a different world with strikes and a newly elected Thatcher government. You bought your music on vinyl records from Record shops, the internet was futuristic, downloading and streaming were beyond imagination and even CDs were years away. Whatever the differences, there are many similarities between 1979 and 2014 especially when it comes to making ends meet and social and political ills, the inspiration for this song, “Nothing Change”. The A side “Nothing Change” is the band’s vocal take on the song demonstrating that even after thirty five years, a band can improve with age and with its classic reggae sound this is surely up there as one of their best compositions. The inclusion of horns is a nice touch as it harks back to Talisman line-ups of old adding both an extra layer to the sound and emphasising the classic nature of the song. For the B side, the mixing duties are in the competent hands of Dave “Oldwah” Sandford, whose remix of the band’s current “I-Surrection” album was recently released as the “Oldwah Deconstruction”. Oldwah starts off with the rather splendid “Conquering Lion Dub”. The vocals are entirely renounced in favour of the horn line although at one stage this is joined by the roar of a rather angry sounding lion, hence the title. This heavy dub version is reminiscent of classic dub sounds of the 1970s and is a real treat for all dub loving Talisman fans. For his second version “Oldwah Rockers Dub,” Oldwah takes the track in a different dubwise direction following a more conventional path and incorporating Dehvan’s vocal parts. All in all this release has three great mixes, each of which stands on its own merits and should appeal to any reggae lover not just those who have already discovered Talisman. 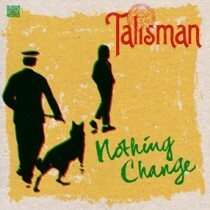 Talisman’s “Nothing Change” is released on 12” Vinyl EP and digital download by Sugar Shack Records on 29th September 2014. The vinyl is available from all good retailers and the download is available on all leading platforms. In addition to the standard black vinyl release in a plain black Disco sleeve, there will also be just 100 copies pressed on yellow vinyl and housed in a specially designed screen printed jacket. This strictly limited version will be exclusively available at the band’s forthcoming shows or directly from the Sugar Shack Records web store while stocks last. Legendary Handsworth, Birmingham reggae figure Fatman, has returned to the studio and will be releasing the first new Black Symbol album in thirty years when new CD “Journey” is released by Sugar Shack Records. During the late 1970s and early 1980s, Fatman and Black Symbol helped to put Birmingham’s Handsworth area firmly on the reggae map with a series of Black Symbol singles and three albums done in conjunction with other local artists, including the two legendary volumes of “Handsworth Explosion” mostly released on the band’s own eponymous label. Over the last thirty years, those original Black Symbol releases have grown in status as more and more people discover them and the original Black Symbol recordings will see a comprehensive reissue programme by our sister label Reggae Archive Records. Although the stream of releases had stopped, Fatman himself continued writing and recording music and having already returned to live performance, to great acclaim, he has decided the time is right to release new music and spread the Black Symbol message to a new worldwide audience. The ten songs on “Journey” are brand new and have been produced by Paul Horton for Ecks Productions. Paul has twice been nominated for a Grammy Award for his work on Steel Pulse’s “Victims” and Pato Banton’s “Life Is a Miracle”. Although the music benefits from Paul’s experience and knowledge of the latest production techniques, he’s been careful to ensure that the music recalls the Black Symbol of old and retains that original spiritual edge. Spiritual is perhaps the best word to describe this collection of songs and there couldn’t be a more apt title than “Journey”; our lives are a journey. Fatman’s journey has taken him from St. Ann’s, Jamaica to Handsworth, England and now increasingly he is looking towards Ethiopia and Africa. It is a theme that recurs throughout the songs on this collection. When Fatman sings “Mama Africa”, he sings of Africa as his home land just as much as Jamaica or England. Africa is the mother that gave birth to all humanity whilst in “Bongoman”; he quotes from Psalm 137 a tale of exile and weaves it into a song of great beauty and spiritual power with Nyahbinghi undertones. The theme of travel is repeated in “Morning Dew” and title track “Journey” where he proclaims that “Rasta no build his house on sinking sand”. Fatman rejects the corruption of modern society, we must come away from the “muddy water” and drink from the pure spring of Rastafari. Fatman is not afraid to proclaim his faith throughout this album, in fact that’s exactly how he begins with the track “I’m not Afraid”. Positive, uplifting and spiritual messages fill the songs on this collection in tracks like “Do Jah Work” and “Let It Shine” whilst “What A Joy”, celebrates an imaginary coming together in one love and unity of all branches of Rastafari. Special mention should be given to Empress Bev, whose backing vocals add so much to the unique sound of this album and help it stand out from the crowd. Black Symbol always sounded different from any other British reggae, the music always felt as though it had flowed straight from a spring in the hills of Jamaica rather than coming from the bricks and concrete of Birmingham and that sound is retained. There is still nobody making music like Fatman, one of the unsung voices of British reggae is back and the time is right for his message to spread to every continent. The journey starts here. “Journey” is released on CD by Sugar Shack Records on 27th January 2014, available from all leading retailers worldwide. When Talisman finished recording their latest album “I-Surrection”, as an addition to the David Hill produced finished release, we decided to give the unmixed master recordings to Dave ‘Oldwah’ Sandford and see what his take would be. Oldwah has previously worked with us, mixing the Vibes album “Reminisce” and was also the man given the job of mixing the unfinished tracks on the soon to be released Capital Letters archive album “Reality”. With 40 years experience as a performing musician and an even longer standing love of reggae, he brings his own unique perspective to the task. Having talked to the band and hitting it off with fellow bassie Dennison Joseph, Oldwah was keen to produce something that bore his stamp but also pleased the band members. He describes his take on the music as “a piece of vinyl from 1978 taken out of a dusty sleeve”, not slick and clean but having that authentic vibe. Influenced by the classic dub sounds of albums like “African Dub Chapter 3” and “King Tubby Meets the Rockers Uptown”, Oldwah’s dubs take you on a journey and as a musician he focuses in on instruments sometimes blending them together to great effect. This is brand new music and yet it absolutely sounds like it was recorded and mixed in downtown Kingston circa 1978. What Oldwah has given us is an anachronism, a classic seventies dub album recorded and mixed three and a half decades and four and a half thousand miles away from its spiritual home. An album that just grows on you and rewards every new listen revealing a little more each time, no gimmicks or crazy effects, just a producer with an understanding and appreciation for the tracks. If you think you know the “I-Surrection” album then think again, the Oldwah Deconstruction is a remix in the true sense. He may have used the same ingredients, but he’s cooked up an entirely different dish. If you loved David Hill’s main course you really need to sample Oldwah’s dessert with its extra large vintage dub topping and entirely different flavours. As a bonus, for this release we’ve included some fresh tracks from the band, extra tracks from the “I-Surrection” sessions also given the Oldwah treatment making ten different songs plus two additional mixes, a round dozen dub shots for Talisman fans old and new. 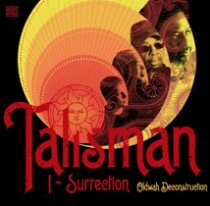 Talisman’s “I-Surrection (Oldwah Deconstruction)” will be released on CD and Digital Download by Sugar Shack Records on 14th July 2014. 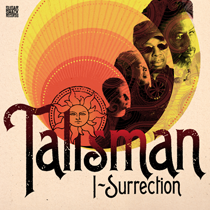 Thirty years after they recorded their debut long player, 1984′s ‘Takin The Strain’, Bristol’s roots reggae pioneers Talisman have found enough space in their busy live schedule to record their third studio album, ‘I-Surrection’, to be released via Sugar Shack Records on 30th September. Having reformed in 2011, Talisman have spent the last two years honing their skills and playing live shows at every opportunity, including the support slot on The Selectors’ recent UK tour. Original core members Dehvan and Dennison have also found the time to write the six new songs that, along with their instrumental and dub counterparts, form this latest twelve track set. It’s hard to escape the economic and political similarities between today and the bands early eighties heyday, so it’s no surprise that all of the songs deal with political or roots themes and resonate with the classic sound of British reggae from the golden age. From the opening lines of “Greetings and Salutations”, it’s clear that you are in for a treat as the timeless sound of roots reggae bursts forth from the speakers and envelops the listener. 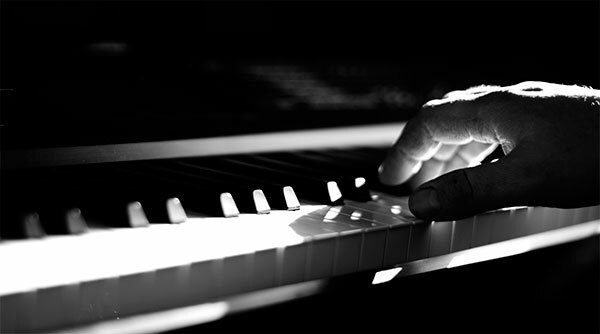 Conscious lyrics underpinned by great music, is a winning combination. With its call to arms, “Stand up and help yourself, stop hoping for things to change, stand up and help yourself”, “Help Yourself” is a call to arms in the anthemic tradition. Talisman haven’t given up the fight, they’ve just been regrouping and with this album they return to the struggle with a full frontal attack. “Season For Freeman” propelled along by the addition of some great playing from Matic Horns could almost be a lost gem from the seventies, if its catalogue of black martyrs didn’t include the recent losses of Stephen Lawrence, Trayvon Martin and Smiley Culture. The point that whatever progress society has made some things haven’t changed is subtle but well made. The album takes an almost Nyahbinghi direction as we “Praise Jah”, an upbeat and joyous track that’s almost hymn like and makes one want to sing along. “Things a Get Tough” has an almost sixties feel, reinforced by the repetition of the lines “rougher than rough, tougher than tough” lyrics that strongly recall the classic tunes of the rude boy era. Even if they’ve cleverly given a nod to the past the lyrics themselves are just as relevant to today where it’s more about the tough economic situation than which rude boy or singer is the toughest. Every track comes with its corresponding dub version, skilfully mixed by David Hill for Rootikal Productions and dub in the best sense, where each version stands on its own musical merits as a fully thought out track rather than being a mere afterthought. The sole exception is ‘Hey Yout’ which rather than a full dub workout gets reimagined as a classic sounding melodica version. Jashwha Moses is back. Having taken nearly three and a half decades between releasing his first single and his first album, last year’s career spanning “Joshua To Jashwha – 30 Years In the Wilderness”, on our sister label Bristol Archive Records, he’s wasted no time in following up its success with an album of brand new material, “No War On Earth” released by Sugar Shack Records. Continuing the themes that have infused his previous material, this is proper roots reggae, music with a strong social and spiritual message spread across nine vocals and six dubs. The music is brand new and yet instantly familiar, due to it’s classic reggae sound shaped by Jashwha’s long term collaborator and producer Mikey Taylor-Hall. In addition to brand new songs they have also reworked both “Jah Time Has Come” and “Steel” for inclusion on the new set, helping the sense of familiarity. 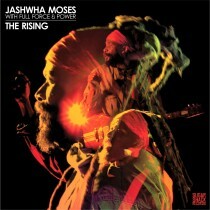 This album symbolizes the birth of Jashwha reggae Jahggae. Jashwha and Mikey have hand picked a new backing band and Jashwha has already started to take these songs on the road winning new fans as well as being a welcome return for those who remember his classic shows of old. 2013 looks like being a great year with many shows in the pipeline to support the new album. Hot on the heels of Black Roots “On the Ground”, Sugar Shack Records continue their quest to bring back proper roots reggae with another outstanding set from Jashwha Moses and Mikey Taylor-Hall, “No War On Earth” is released on 8th April 2013 on CD and digital download, available from all leading retailers. Set for release on Monday 18th March 2013 on Limited Edition 12” Vinyl & digital download, through Sugar Shack Records. This is the second in a planned series of remixes by the Rootikal Crew out of London. They have turned up the Dub Dial to 11 on “Jah Time Has Come” from the new Jashwha Moses album “No War on Earth” and yet again they’ve exceeded our expectations. If their first remix was imbued with the spirit of mid-seventies downtown Kingston, their take on “Jah Time Has Come” is simultaneously both bang up to date and yet also captures a classic UK vibe. If it was indeed vintage, then no doubt it would now be labelled as a “Shaka Killer”. As it is, the Rootikal crew have already tested its sound system appeal at their own night and it passed with flying colours. It’s a heavy, heavy mix that picks you up and sweeps you along on a four minute spiritual journey. With all this praise for the Rootikal mix, we shouldn’t forget the original mixes are equally brilliant. Both the vocal and dub get a vinyl outing on this 12” providing a totally different, but equally fantastic listening experience from the creators of the music Jashwha Moses and Mikey Taylor-Hall. With more than seventy years of writing and performing reggae between them they certainly know what they are doing and nail both mixes. There are no weak tracks on this record. Jahggae has arrived. As if three strong cuts of “Jah Time Has Come” weren’t enough, we’ve really bumped up the value with both the vocal and dub of “Suffering Is In The Past” from Jashwha’s previous album, “Joshua To Jashwha – 30 Years In The Wilderness”, (Bristol Archive Records). 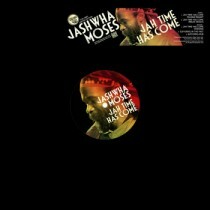 For various reasons we couldn’t include these two excellent tracks on the vinyl release, an oversight that this new Jashwha record has allowed us to correct Released 18th March 2013 on limited edition 12” vinyl from Sugar Shack Records and with five excellent cuts “Jah Time Has Come” is an essential purchase for all reggae fans and sound men. Set for release on Monday 25th March 2013 on CD & digital download, through Sugar Shack Records. Originally formed in 1980, Pigbag burst into the charts and the public consciousness with their first single, “Papa’s Got A New Pigbag”, a track that retains its dance floor appeal to this day. The band toured extensively in Europe, Japan and the United States, released two albums, appeared on ‘Top of the Pops’ twice and built a loyal fan base before they split in 1983 due to musical differences. Pigbag were part of the first flowering of the Bristol music scene when the City’s musicians were creating their own unique synthesis of styles and finally being noticed by those outside the City. Perhaps if things had worked out differently Pigbag would have stayed together longer continuing to evolve musically and achieving more of the success they deserved. Now they have a second chance. Thirty years after they split up, Sugar Shack Records are extremely pleased to announce that not only are Pigbag back with founding members Chris Lee and Ollie Moore as well as original member Kofi Adu, but they have recorded an album of brand new material entitled “Year of the Pigbag”. Having spent the intervening years playing with groups as diverse as the Pogues, Abyssinians, Neneh Cherry, Osibisa and Mulato Astatke, the trio of original members were inspired by the re-release of their back catalogue to reform and recruit five new and very talented musicians who shared their vision of fusing African grooves, jazz, latin, funk and dance beats into a heady new cocktail to invigorate the 2010s just as they did the 1980s. With the classic eight piece line-up and full brass section, just as when they started in Bristol, the band’s new material is a joyous fusion of propulsive basslines, catchy horns and irresistible percussion all seamlessly blended into a heady mix that finds your feet tapping along as the urge to dance takes over. I can’t wait to see the band live as this CD is a nonstop dance party of the highest order with echoes of the JBs, Fela Kuti and Sun Ra’s Arkestra yet entirely different and their own unique creation, with music this catchy perhaps 2013 will be the year of Pigbag. 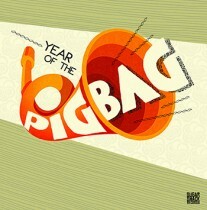 “Year of the Pigbag” is released on CD and digital download by Sugar Shack Records on 25th March 2013, available from all good retailers. 2012′s “On The Ground” was the first new Black Roots album in more than twenty years and was eagerly received by fans old and new. As well as gaining numerous fantastic reviews, more than three decades after their formation, Black Roots were back as though they’d never been away and their music was equally relevant in the present as it was thirty years ago. To celebrate the success of “On The Ground” and also to satisfy numerous requests from the band’s fans, Sugar Shack Records in conjunction with Nubian Records, have decided to release the dub counterpart to the album “On The Ground In Dub”. 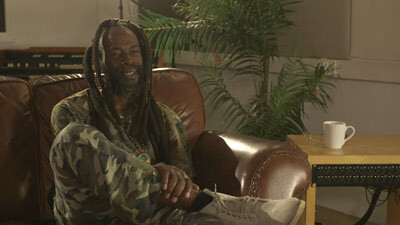 The dub mixes have been done by Louis Becket, a man who has a long history working with leading reggae bands including Misty In Roots and Culture. He has used those years of experience to craft a dub album worthy of comparison with those from the music’s peak during the 1970s. Recorded with a full band including a horn section, the dubs hark back to that time before digital production and sampling took over. Focusing on the rhythm section with the horns dropping in and out, weaving a new tapestry from the original multi tracks, this is classic dub music of the sort that has been rarely made in the last thirty years, a modern dub classic. Stripped down and rearranged, “On The Ground In Dub” is a worthy release and stands on its own merits as a fine album that will appeal to all fans of dub Equally, those that already love the vocal album will get renewed enjoyment, hearing their favorite songs reshaped with the same authentic sound and attention to detail that have helped “On The Ground” succeed so well. Pompous Way Released 15th October 2012 on 12” Vinyl (Limited Edition) & Digital Download with additional exclusive mixes, through Sugar Shack Records / Shellshock and all digital platforms. October 15th sees the release of “Pompous Way” on Sugar Shack Records in conjunction with Nubian Records, the first new Black Roots single in over twenty years. “Pompous Way” is taken from the band’s new critically acclaimed album “On The Ground” also released by Sugar Shack/Nubian Records. The double A side twelve inch vinyl release features an exclusive extended mix of the album version of “Pompous Way”, clocking in at nearly seven minutes the vocal is seamlessly followed by the dub in classic discomix fashion. Although recorded this year and dealing with the economic and political mess we are currently facing, the song doesn’t attempt to cater to any current fads. Instead it’s a slice of roots reggae the way it used to be, real musicians playing real instruments and singing about real problems. For the AA side we have teamed up with Rootikal Productions, which is David Hill and Ashley Beedle – both men are long-time reggae lovers who bring a wealth of musical experience to the project. David is one of the people behind Rootikal, one of London’s most successful reggae nights, which has hosted some legendary guests including Cornell Campbell, Linval Thompson and Al Campbell – plus A-list selectors such as David Rodigan, Channel One and Aba Shanti I. He’s recently overseen the Rootikal Selection series of 45s, reworking versions of hard to find or unreleased Jah Thomas productions and re-editing dubs or adding trombone overdubs with Matic Horns. Prior to that, he worked with David Katz reissuing rare reggae on the Auralux label. Ashley is perhaps best known for his role in X-Press 2, The Black Science Orchestra and the Ballistic Brothers (also with David). In 2010 he recorded an album with reggae great Horace Andy, which led to a European tour. Ashley and David recently had the privilege of remixing several Bob Marley and The Wailers tracks after Island Records gave them access to the original Tuff Gong multi-track masters. They also present the Rootikal radio show together. Rootikal were given free reign on the mix and their “Rootikal Humble Yourself Version” takes the track in a whole new direction. Shifting the emphasis onto the rhythm, the drum, the bass, the guitar, the horns and adding just a little melodica, the track is reinvented for the twentieth century. It becomes a lost classic from the late seventies and an entirely different listening experience. 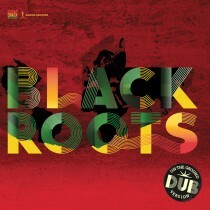 Following the 2011 release of “Black Roots – The Reggae Singles Anthology ” and the 2012 rerelease of “All Day All Night” deluxe version by reissue label Bristol Archive Records, Black Roots and their label Nubian Records have now teamed up with Bristol Archive’s parent label Sugar Shack Records to release their brand new album “On The Ground”. It may be more than twenty years since the original line up were together in the studio, but for their new record they’ve picked up where they left off and are right back in that classic Black Roots groove that will keep their existing fans happy and appeal to a whole new generation of reggae lovers, many of whom weren’t born when Black Roots released their string of classic records. The music is entertaining and upbeat, but it is still roots music. These songs have a social message that is just as relevant in the troubled world we inhabit in 2012 as the band’s songs were during the ups and downs of the 1980s. Opening track “I Believe” makes it clear that for all the progress we’ve made, for many people life today is just as hard as it’s ever been. Surviving the system isn’t easy. Second track “Pompous Way” is also concerned with society, but this time with fixing it and reaching out to the next generation rather than labelling them as the problem. The music itself harks back to Black Roots of old and other than the mention of the digital age could easily have been recorded thirty years ago. Another song that sounds like it could have come from the band’s first incarnation is “Militancy” definitely sounding like Black Roots of old and also touching on the theme of slavery, a theme that receives further exploration in the aptly titled “Slavery” recalling the memory of the great evil that befell millions of Africans and their descendants. For our first venture into reggae, Sugar Shack have teamed up with a new group, AMJ Dub Collective. The group’s name may be new to people, but their part in Bristol’s musical heritage goes back more than thirty years. Mark Spence and Andy Clarke, the band’s rhythm section are graduates of Zion Band from which they progressed to legendary Bristol band Restriction, (music from both bands can be found on our sister label Bristol Archive Records). The third member of the trio is producer John Hollis, another Restriction graduate and for their first release they’ve called on two other former band mates Eric ‘The General’ McCarthy on MC duties and Bristol legend Rob Smith for a brace of mixes. The trio’s aim was to recreate the classic reggae sound that they grew up with, yet they aren’t afraid to bring things up to date where appropriate as well as bringing in some guest musicians for an added Latin twist that harks back to Jamaican music’s origins and close links with Cuba and the wider Caribbean. 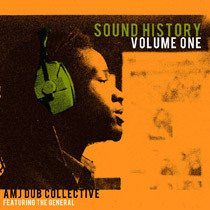 The idea for these tracks came from Mark Spence who felt it was long overdue to document in song the City’s rich heritage of sound systems, their selectors, MCs and the posses who supported them, a tribute to the reggae scene that nurtured and inspired the members of AMJ Dub Collective as well as countless others over the decades. The choice of Eric ‘The General’ on microphone duties was obvious as not only had he taken that role in Restriction, but was also an MC on legendary Bristol sound system Enterprise. His delivery has lost nothing in the last thirty years and it’s great to be able to hear him again. Rob Smith needs no introduction and although his career has covered the “Bristol Sound”, drum and bass and dub step, he has never drifted far from his reggae roots, having been a founder member of both Zion Band and Restriction, it’s only natural that his mixing talents were called upon and he certainly delivers.